Albany Strollers & Rollers (AS&R) was founded in 2004 to address bicycle and pedestrian safety issues in and around Albany, California. Currently, we comprise approximately 700 individuals and families. Our mission is to promote bicycling and walking as superior forms of transportation, to increase bicycle access, safety, and awareness, and to champion the development of safe routes for bicyclists and pedestrians within Albany. We aim to improve facilities in Albany, serve its citizens and those of nearby communities by helping to educate and provide services, provide support and guidance to the City of Albany within the goals of the Metropolitan Transit Authority and the State and Regional transit plans with a focus on maintaining or bike friendly and green community. Meetings occur each month alternating between Policy Happy Hours and business meetings. Meeting schedules can be found in the calendar on this site. Albany Strollers & Rollers is fiscally sponsored by Bike East Bay, a 501(c)3, so donations to AS&R are tax-deductible. THIS SPACE OPEN… how about you? Read on for a more detailed summary, or download a PDF of the original 2008 article. History: Albany Strollers and Rollers (AS&R) was founded in 2004 by Preston Jordan and Nick Pilch. The original impetus was the dangerous freeway onramp crossing on westbound Buchanan to reach the Bay Trail, and the need to create a safe alternative to both the freeway onramp crossings and the available but undeveloped pathway under the freeway accessed by crossing the railroad tracks. 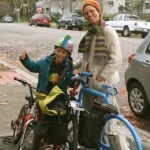 GPC members Amy Smolens and Sherie Reineman, both active cyclists and longtime bicycle commuters, joined AS&R in 2005 to become better informed and to have a hand in steering the course of transit and proposed development in Albany. Issues affecting bicycle and pedestrian transit included Bay Trail connections at the waterfront and the bike lanes along Marin Avenue. In 2005 AS&R had about 40 members; it now (as of this 2011 article) has 449 member households, more than a tenfold increase.. The group’s mission, as a part of the community, is to increase bicycle access, bicycle-safety, awareness, and safe routes for bicyclists and pedestrians within Albany, especially those routes which funnel into the Bay Trail and into our neighboring communities. We aim to improve facilities in Albany, and provide support and guidance to the City of Albany within the goals of the Metropolitan Transit Authority and the State and Regional transit plans — with a focus on maintaining our bike friendly and Green community. Albany has the second highest (to Berkeley) cycle to work mode share of cities in Alameda County. in 2000, the most recent year for which statistics are available, it was 4.1%. Judging from the number of bicycles we’ve all seen on the roads lately, those numbers have certainly risen dramatically since then. Albany is in the top 3% nationally compared to similar size towns with regards to number of residents biking and walking to work. The beauty of a small city like Albany (18,000) is that the government not only pays attention to us but asks for our involvement. Our input is respected by city officials and we are in a position to get projects implemented. We make sure to have at least one member at the monthly Traffic & Safety Commission meeting as ‘watchdogs’ for cycling and pedestrian issues. Sometimes meetings that don’t seem to even be related to cycling issues have a cycling aspect to them. As cyclists, AS&R members are in a knowledgeable position to bring up questions for the City or the Commission which might otherwise not be considered. An attending member then does a write-up about the meeting and sends it to the AS&R list so everyone is aware of what’s happening and can get involved. Albany is small, but in a crucial location as the crossroads of the East Bay and to the Bay Trail, which we all use. GPC members are likely users of Albany streets and bike facilities, as commuters and recreational cyclists, so it’s in everyone’s best interest to become involved in and support AS&R and Albany’s cycling issues. We’d like to encourage GPC members who live not only in Albany, but in contiguous communities, to join Albany Strollers and Rollers (It’s free!) and become active in improving cycling conditions in the East Bay. AS&R Bicycle Advocacy Events: Energizer Station at Bike to Work Day (Annual – Marin & Ohlone Greenway): In addition to the items donated by the official sponsors, we negotiate directly with local merchants for extras — Solano Avenue Cyclery, The Missing Link, Tay Tah Café, Chipotle Mexican Grill, Safeway – water bottles, patch kits, coupons, drinks – conveying a message that we want to get people on their bikes, but also show the community that there are a lot of cyclists in Albany and they should respect and welcome them. 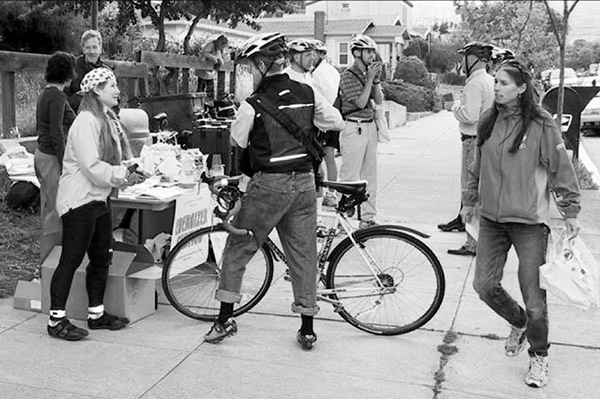 The number of commuters stopping by our Energizer Station increased from 93 in 2005 to 514 in 2011. Greening Albany — “A Community Event to Fight Global Warm- ing” (June – Annual): Sponsored by the Albany Green Chamber of Commerce, whose mission is to show local residents various ways to live their lives in a Green fashion. 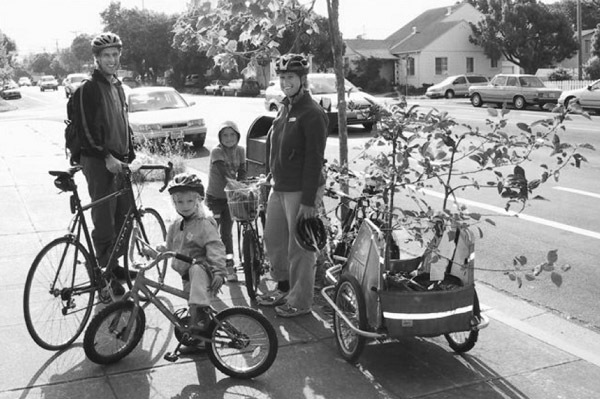 In 2007 Councilwoman Joanne Wile approached us to have a booth at the event, saying “We really want a good bicycle presence at the event.” Members brought various types of bikes, bicycle safety equip- ment (lights, reflective clothing, etc.) and accessories to demonstrate options for using bicycles as viable means of transportation for commuting and daily errands. We spoke to residents of Berkeley, El Cerrito, Richmond, Kensington and Oakland, in addition to Albanians. 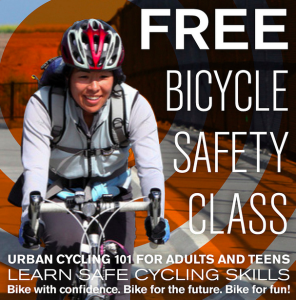 The aim is to get everyone using their bikes as everyday transportation as much as possible. 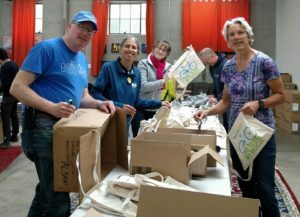 The Albany Spring Art & Music Festival is an annual event: To get prospective cyclists in the community prepared for the upcoming Bike to Work Day, AS&R teamed with Street Level Cycles, who volunteered mechanics and a double work stand for the day. The booth tuned up 60+ bikes in the five hours of the Festival and signed up 25 new members. Better yet, we saw a few of those people whose bikes we tuned up on Bike to Work Day! Recently Amy saw one of the women with her kids on BART with their bikes who reminded Amy that we tuned up all three of their bikes! 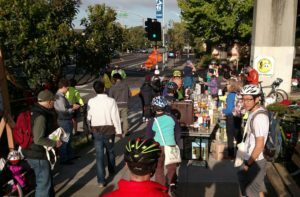 We knew we were accepted in the community when earlier this year the city asked for one of our members to be on the selection committee choosing the firm to design the Buchanan Street bike path and extension of Marin Ave bike lanes. That’s a crucial link between the Ohlone Greenway and the Bay Trail. The US Department of Agriculture is blocking the bikeway from going on the South side of Buchanan on their property, due to “homeland security” issues. Preston Jordan has contacted Barbara Lee and other politicians to request their involvement. Again, this access is important for anyone who uses the Bay Trail. Why GPC?? 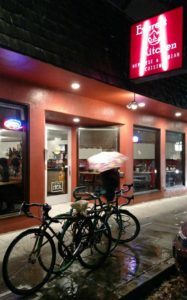 : As GPC members, we are aware of the club’s involvement and interest in supporting local bicycle advocacy; an example which comes to mind is GPC’s donation of the park bench at Bovine Bakery which was purchased with GPC funds and installed with Mark Sapiro’s generous labor as a good faith “give-back” gesture to that community. Since bike advocacy, especially locally, is high on GPC’s priority list, we think, as club members, that Albany Strollers and Rollers is a worthy organization and a logical choice for the club’s support. GPC members interested in joining AS&R can email either Amy Smolens (calamari@alumni.duke.edu) or Sherie Reineman (bikedive@mac.com) and we will sign them up. It’s a low volume list but especially now with the Buchanan Street path on the line, involvement is crucial.